The first cruise ship I ever sailed on was the Celebrity Equinox and I remember being pretty astonished when I first stepped on board at just how big the ship was and how many amazing facilities they’d managed to fit in. Not least of which was a real grass lawn covering over half an acre of the top deck. With that in mind, I was pretty curious to see what Celebrity had got planned when they recently announced the launch of a new class of ships in 2018. It was clear that they’d have to come up with something pretty impressive if they were going to rival their existing Solstice class, of which there are now five – Solstice, Equinox, Eclipse, Silhouette and Reflection. All of which are regularly rated as being amongst the most popular ships in the world. There was a time when the press release for any new ship launch used to start off by saying that the new vessel would be the biggest cruise ship ever created. Now we’ve somewhat reached the limits of what is physically possible and, perhaps more importantly, the limits of what customers consider to be desirable. Most cruise travellers have come to appreciate the advantage of bigger ships (more space, better facilities, and less susceptibility to rough seas). Most still draw the line somewhere and don’t want a 20-minute walk to dinner. So the Celebrity Edge will actually be a similar size to the Solstice and will accommodate around 2,900 guests. Celebrity has long marketed itself on the basis of offering “Modern Luxury”. It’s no surprise that the Edge features a modern design. What is perhaps surprising is just how modern that design is. Computer-generated previews of ships often make them look more futuristic than they actually are. I must say that so far the Edge looks less like a traditional cruise ship than pretty much any ship I’ve seen before. Dramatic sweeping curves replace the straight lines that are normally a key part of cruise ship design. Light colours and glass are very much the order of the day onboard the Celebrity Edge. In place of traditional dark wood and metal fittings, all aimed at providing a much brighter and airier feel on board. 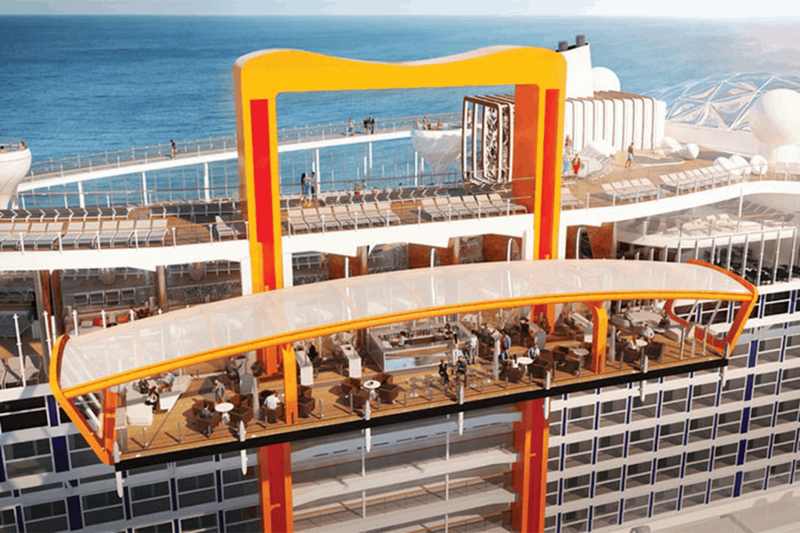 Ironically for a ship called the Celebrity Edge, one of its main selling points is the fact that there will be no boundary between ship and ocean and the ship will feature so called “infinite” balconies on all of its veranda staterooms. These are effectively automated foldaway doors which allow the whole cabin to be opened up to the outside. Rather than the balcony being a separate space. 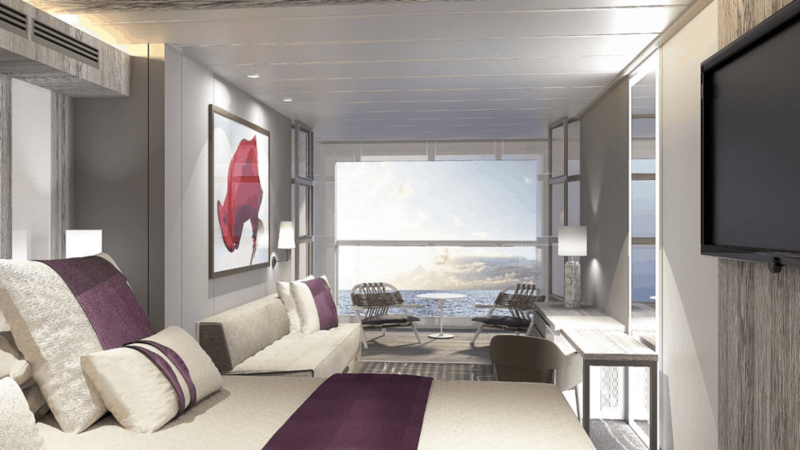 This of course also makes more efficient use of the available room and allows Celebrity to offer what it says will be class-leading cabins in terms of size and space. 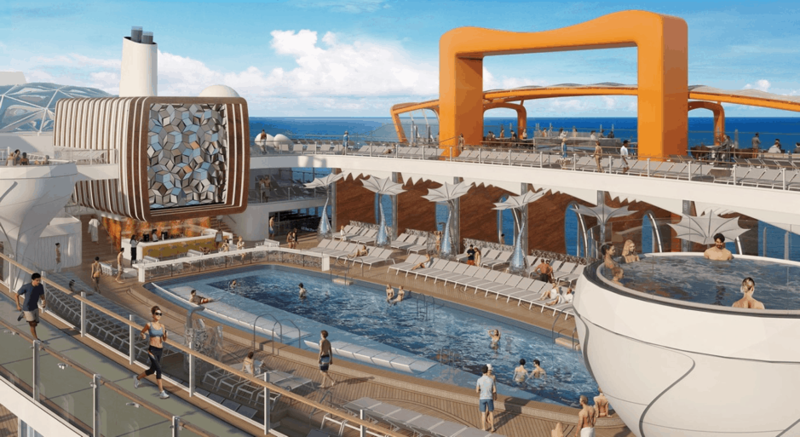 That’s not something I ever imagined writing in a ship review… but Celebrity have announced that the Celebrity Edge will feature a “Magic Carpet”. This it seems will be an overhanging cantilevered deck featuring a bar and seating area. Which moves up and down the side of the ship. 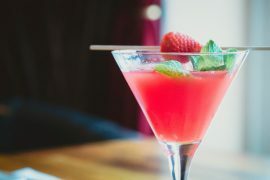 Allowing guests to enjoy a drink anywhere from high up above the top deck to right down at the waterline. 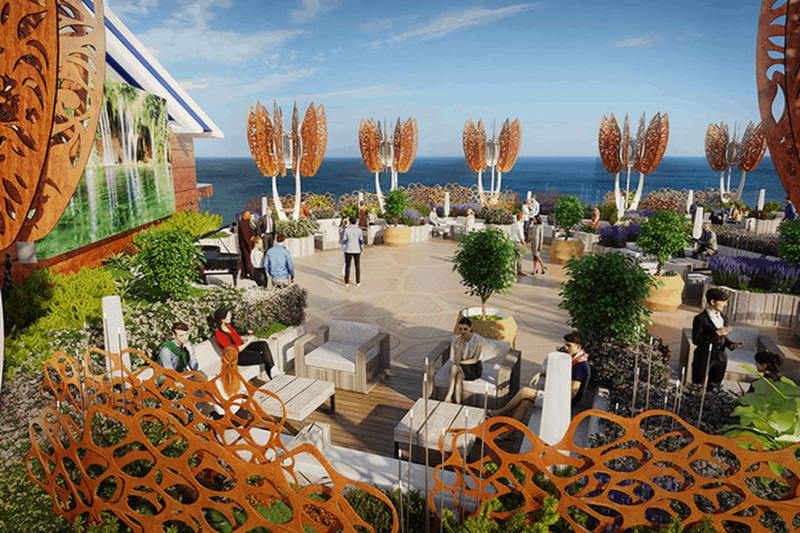 Whilst unquestionably a bit of a gimmick, this is a clever idea as it will allow guests to get far closer to the sea than is ever normally the case on big cruise ships. 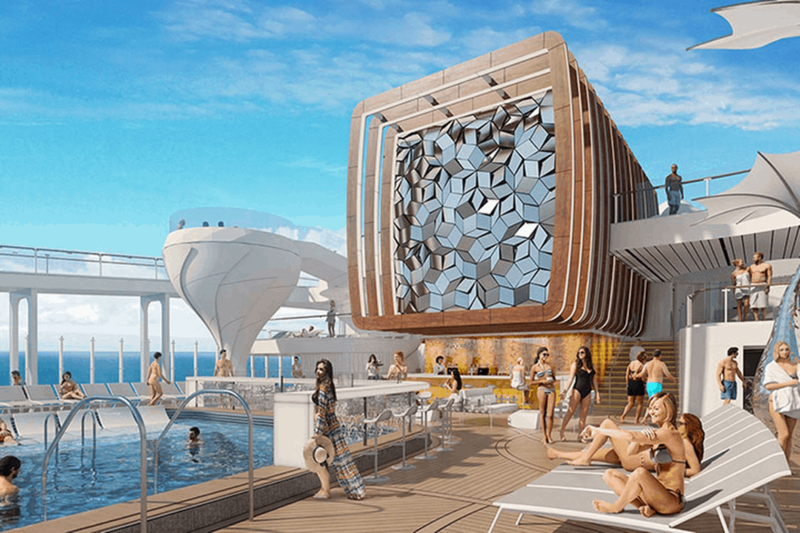 This is seemingly a big part of Celebrity’s vision for the Celebrity Edge. Unsurprisingly there will be no lawn on Edge (they’ve already got that well covered on their previous ships). In its place will be a roof top garden which will double as a bar and entertainment space. This is a nice touch as it recognises the fact that some people want peace and quiet. Even on board a massive cruise ship. It means that there is big outside area for people to relax away from the hustle and bustle of the traditional pool deck. No, I don’t know what that means either, but I can say that the pictures look very impressive indeed. In a nutshell, Eden is an enormous three deck atrium space constructed almost entirely out of glass. It will combine a lounge, café, bar and restaurant. The use of the venue will change during the course of the day, initially offering a relaxed setting for breakfast and lunch. Before becoming a smarter restaurant in the evening and then a bar and dance venue after that. Although perhaps not quite as unique as Celebrity might suggest. 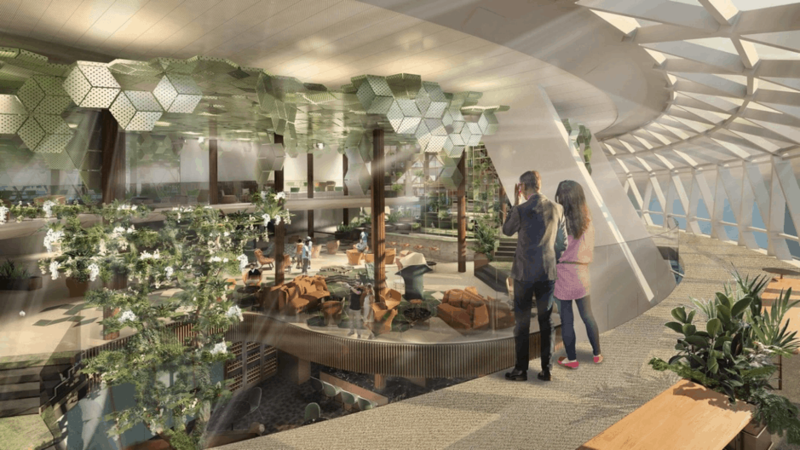 (It does share certain similarities with the “Two70” venue found on board Royal Caribbean’s Quantum Class ships) the use of real trees and plants and the sheer scale of the construction looks set to make this one of the most impressive venues on board any cruise ship. Emma says: That looks amazing! I love the idea of the open plan balcony cabins/balconies. That makes so much sense. I also have no idea what the ‘sinful’ venue is about though. Thanks a lot for this one Mark! 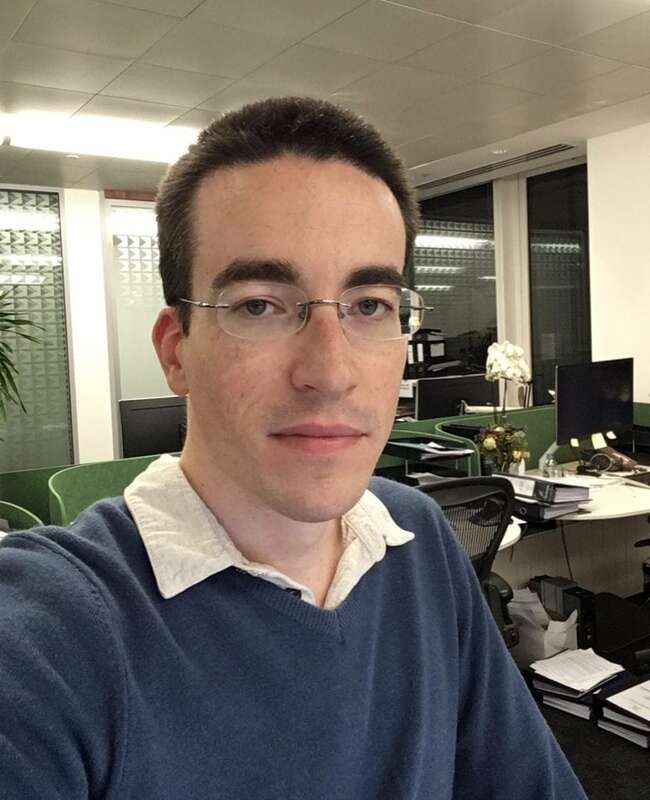 Mark is the founder of CompareThatCruise.com, the UK’s leading price comparison site for cruises. He is a keen traveller and a big cruise fan. 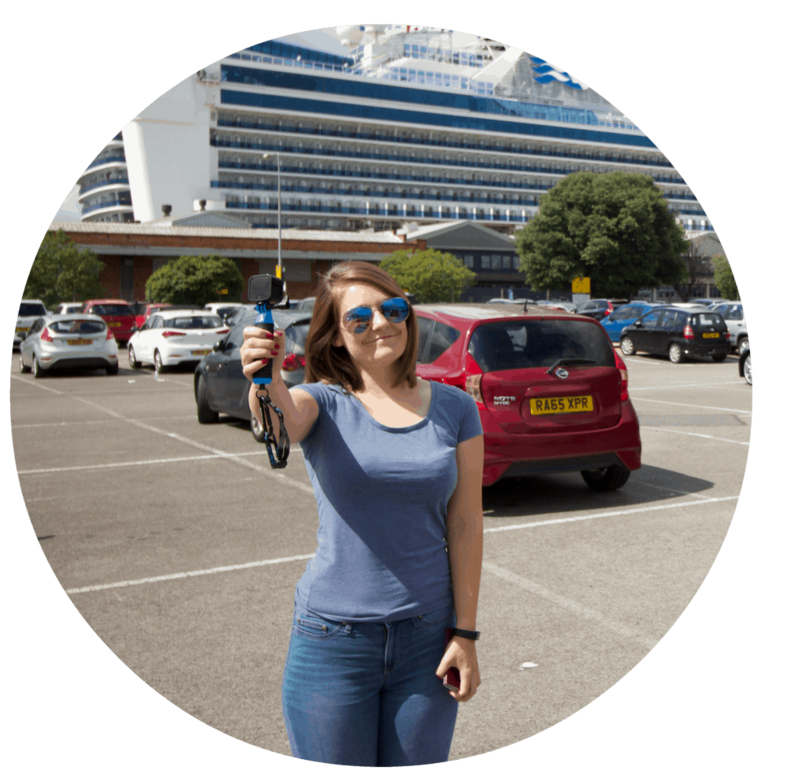 He was inspired to set up the site by his own experience of how difficult it can be to book cruises online. The orange framework that the ‘magic carpet’ goes up and down on looks pretty wrong to me..utilitarian really. Maybe ‘in the metal’ it’ll look more palatable! Yeah, I’m not sold on it. Seems like another thing to break really..
It’s very streamlined either is it, for a ship? It does seem a bit odd to design a ship to look so good, and then put that thing on the side of it. If it had been announced on April 1st I wouldn’t have been surprised if that was their April Fool joke! Sinful area and magic carpet, not sure about those but does looks a stunning ship otherwise. The concept of the balcony cabins is interesting too. We have cruised on the Eclipse and the lawn area to us seemed a nice area but was always pretty empty so maybe with the garden it would be used more perhaps. Great post thanks for sharing! Maybe! I loved the lawn when I visited the eclipse. Think i’d be there all the time..
Not 100% sold on Celebrity, but definitely think they’ll be interesting to keep an eye on! 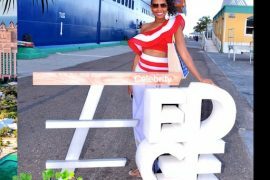 The more we get to know about CelebrityEdge the more excited we get to explore Celebrity’s new ship! I would say me too… but I don’t have a cruise planned on her. Certainly looks interesting though!